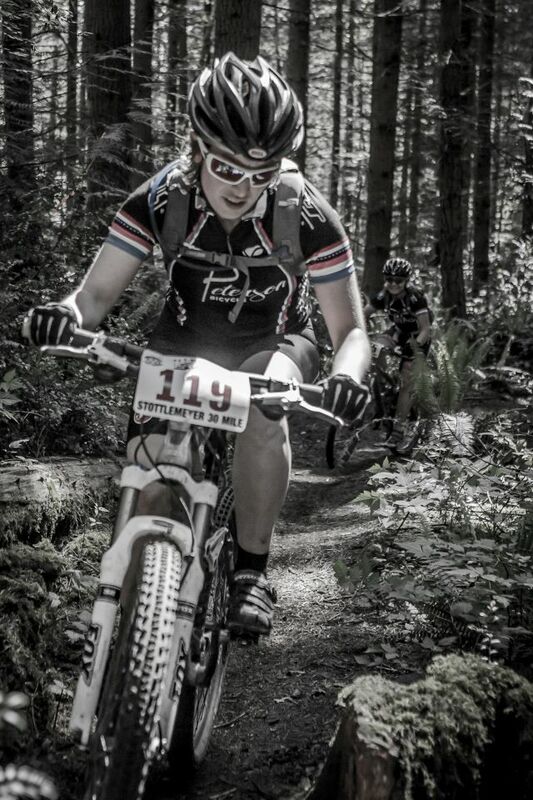 I got an “echo” of my past, so to speak, at last weekend’s Echo Valley Epic 30 mile mountain bike race! Each year, on the last day of school, we observed a great tradition: Mom pulled up in the loaded minivan and whisked us away to Lake Chelan, where we spent a week with some family friends whose grandparents generously loaned us their timeshare. This was the purest of childhood fun: swimming, boating, tennis, morning runs, sunbathing, brownies and ice cream, and movies. Freedom! Bliss! Security! I had a blessed childhood. One year, we got a Barracuda mountain bike, which I adopted. I was so proud because it had SHOCK ABSORBERS! 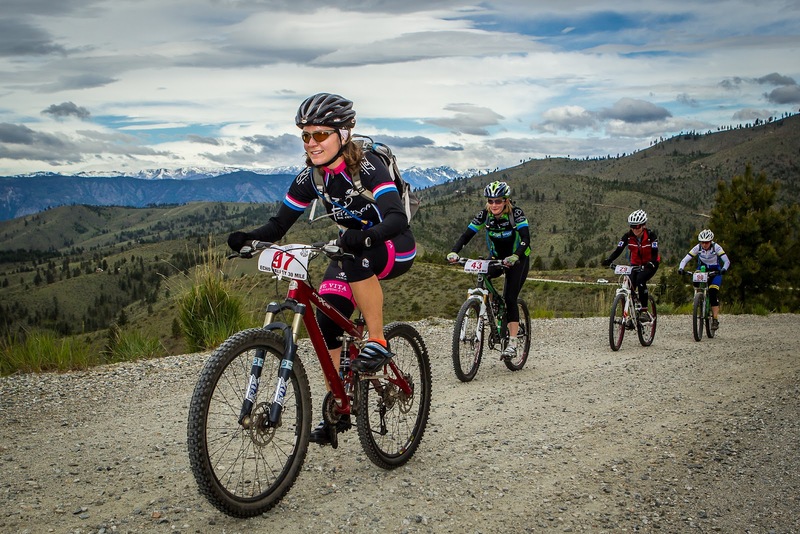 We began taking mountain bikes to Chelan, where we rode the trails of Echo Ridge. I don’t remember much other than dust, heat, and feeling infuriated as my friends faded into the distance on the long climbs. 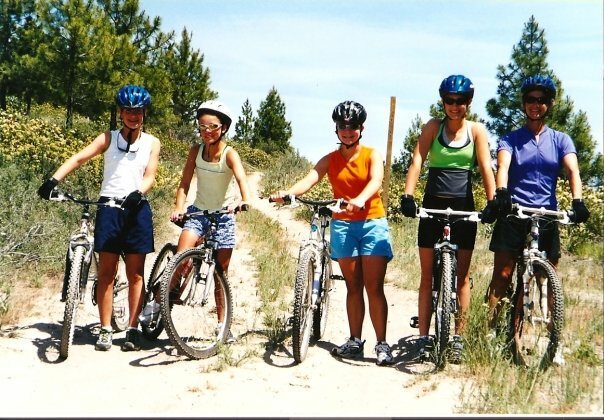 Here’s a group shot; I’m in the middle, in the awkward phase of middle school. I’m probably feeling self-conscious about my huge legs. Little did I know that I’d someday appreciate those legs for their power output! One year, a very important thing happened after an Echo Valley mountain bike ride: the van broke down! We had to pedal all the way back to the resort, a grueling ten miles! OK, most of those miles were downhill, but we probably didn’t have any food or water, and we’d already done a long ride. I vividly remember how famished and proud we were when we finally rolled up to our door. I got a sunburn on my lower back that stayed tan for several years. Looking back, this was an important moment in my life: dealing with the unexpected, doing something you didn’t think you could do, suffering a little, and being thrilled… on a bike. I was in an insecure, nerdy phase of life, so this was a very positive thing for me. Fast forward 12 or 13 years (wow, that is half of my life so far!). It was the last day of school–for my husband Jon, who was about to submit his dissertation to the UW and finish 10 consecutive years of higher education. The end of school means a much different thing now: instead of blissful freedom and security, it’s uncertainty, joblessness, travel, and transition. It’s still the start of an adventure, just a more open-ended one without any illusions of security. Leaving my husband to copy edit his 300-page paper one last time, I picked up my teammate Cathy and friend Kamila and we set out to cross the mountains and race bikes in Chelan. The weather was ominous. 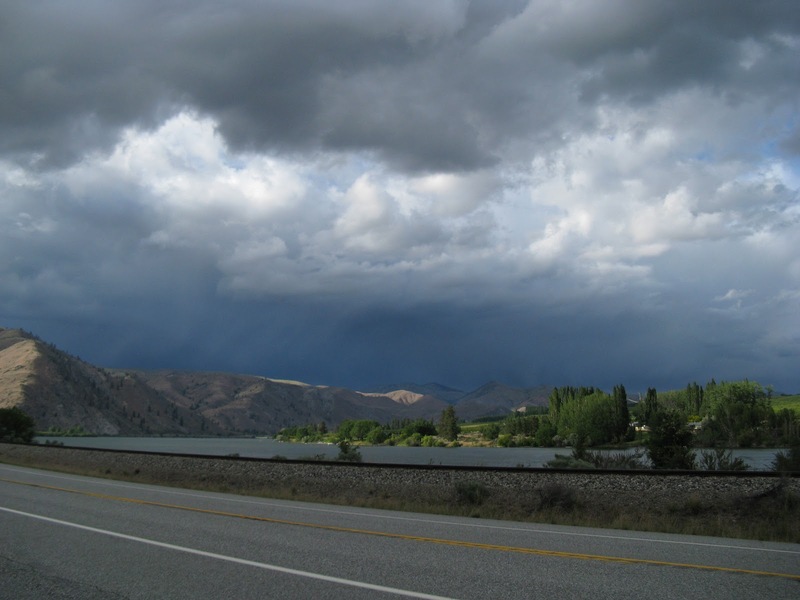 We killed time in the town of Chelan until the rain stopped. It made for a nice, romantic bike picture. It was almost dark when we arrived at the race course, where we pitched my tent and fell sound asleep. The next morning, we had a leisurely start to the day. We enjoyed coffee and oatmeal. Four Peterson Racing girls were there: Cathy, Courtenay, Sarah, and myself. The atmosphere was lighthearted and fun; you wouldn’t know we were about to go out and suffer for 30-60 miles. Since it was windy and cold, I put on a baselayer, arm warmers, knee warmers, and a jersey, which was a good choice. The race began with a 2 mile climb, then entered a 13.5 mile main loop. It was a winding maze of double track, fire road, and a few bits of singletrack. It had about 3600 feet of climbing in 30 miles! Since there were no obstacles to distract me, I set a hard, steady pace and turned the pedals. The scenery was gorgeous and it smelled like ponderosa pine and sagebrush. I had correctly arranged my food and water this time, so I ate plenty and only needed to stop at one aid station. I came in 11th/30 or something, completing the course in just over three hours. 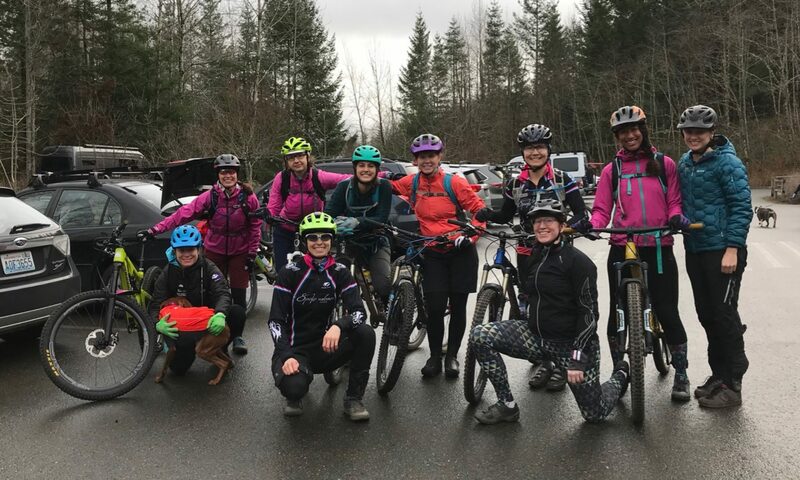 Sarah, who just got into mountain biking, had a very strong race and placed 6th, Courtenay (racing for her dirt team, Cycling NW) WON the 60 miler in under 5 hours, and Cathy was right behind me. Good times were had by all! I would concur, but would like to emphasize, the TWISTY TECHNICAL SECTIONS! My goodness! There were miles upon miles of roots. And I don’t mean, ‘oh, you’re riding along and bump! you hit some roots and pedal on.’ No, no. These are slow grinding roots. Your front wheel is clawing up one while your rear wheel is still slipping down another. I begin to feel like Indiana Jones in a snake pit and the roots are leaving the earth to tangle me up and eat me alive! To further impress this point upon you, I have written some Haikus. now I ride a stump. Ok, for reals though. 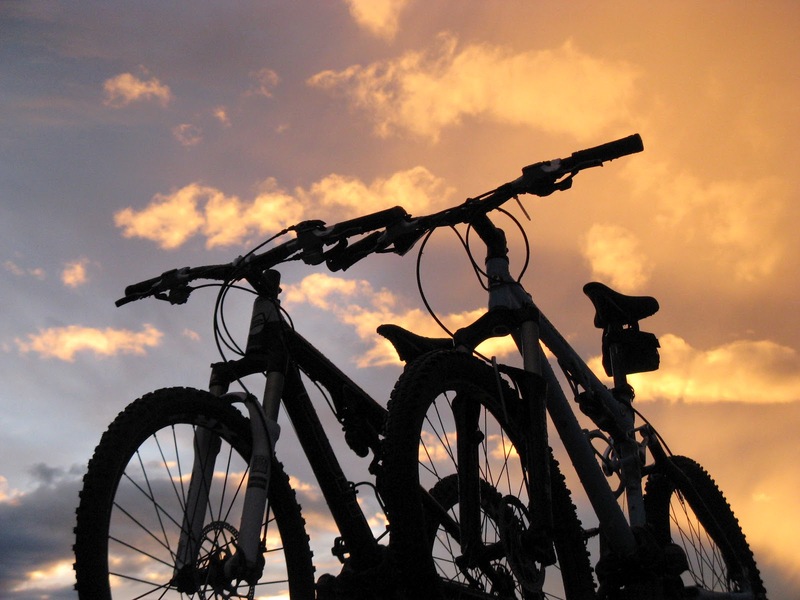 That’s the magic of mountain biking– every course can offer something so drastically different than the last. At Beezely Burn, the sand did not suit me and I got last. At Echo Valley, the climb/descent course design suited me and I won. The unique part of Stottlemeyer was the root sections that tested your slow-speed technical skills. I finished mid-pack. So while Stottlemeyer was not a podium performance for me, it was time well spent on trails that challenged my current skill set.